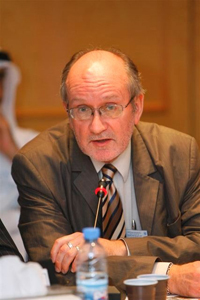 Peadar Kirby is Professor of International Politics and Public Policy in the Department of Politics and Public Administration and director of the Institute for the Study of Knowledge in Society (ISKS), both at the University of Limerick. He had previously worked at Dublin City University since 1995, firstly in the School of Communications and, on its foundation in 2002, in the School of Law and Government. Before becoming an academic, he worked as a journalist in The Irish Times and, between 1984 and 1986, was associate editor of Noticias Aliadas in Lima, Peru. Professor Kirby has published widely on Ireland’s model of development, on Latin American politics and political economy, on globalisation, and on vulnerability/resilience. His latest publications are Celtic Tiger in Collapse: Explaining the Weaknesses of the Irish Model (Palgrave Macmillan, 2010), Transforming Ireland: Challenges, Critiques, Resources, co-edited with Debbie Ging and Michael Cronin (Manchester University Press, 2009), Power, Dissent and Democracy: Civil Society and the State in Ireland, co-edited with Deiric Ó Broin(A&A Farmar, 2009), and Explaining Ireland’s Development: Economic Growth with Weakening Welfare, Social Policy and Development Paper No. 37, United Nations Research Institute for Social Development (UNRISD, 2008). Among his other recent books are the following: Vulnerability and Violence: The Impact of Globalisation (Pluto Press, 2006), Contesting the State: Lessons from the Irish Case (Manchester University Press, 2008), co-edited with Maura Adshead and Michelle Millar, and Taming the Tiger: Social Exclusion in a Globalised Ireland, co-edited with David Jacobson and Deiric Ó Broin (Tasc with New Island Books, 2006). He has also published The Celtic Tiger in Distress: Growth with Inequality in Ireland (Palgrave, 2002), Introduction to Latin America: Twenty-First Century Challenges (Sage, 2003) and Poverty Amid Plenty: World and Irish Development Reconsidered (Trócaire and Gill & Macmillan, 1997). He has published articles in New Political Economy, Review of International Political Economy, Politics and Society, The European Journal of Development Research, Globalizations, Development Review, Irish Studies in International Affairs, The Irish Review and Administration.